A fan who runs? That’s Jim Mowatt. And that makes him almost as rare as the rhinos he wants to save. Save the Rhino International’s vision is for all five rhino species to thrive in the wild for future generations. We collaborate with partners to support endangered rhinos in Africa and Asia. Douglas Adams was a founder member of Save The Rhino and it is through Douglas that I came to hear of the plight of the rhino. I chose ‘Save The Rhino’ as my London Marathon Charity as a homage to Douglas and a desperate hope that I may be of some little assistance in preserving the few remaining rhino so that future generations can witness these astounding creatures. 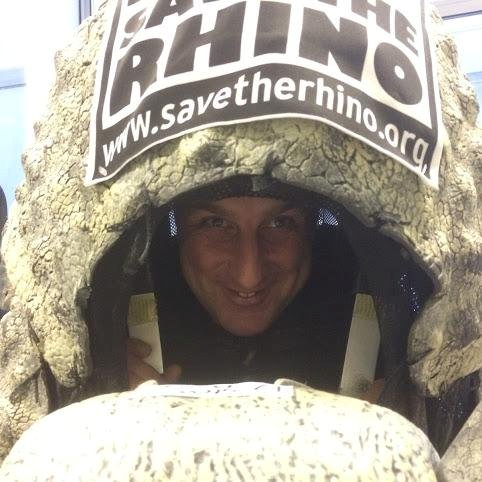 I haven’t the strength or the stamina to drag myself and the rhino suit for 26.2 miles. I will instead be resplendent in blue tee shirt that exhorts people to save the rhino. I’ve just taken it to t-shirt printing place to have my name on it too lest I forget who I am part way through marathon. This entry was posted in Heard Online and tagged Jim Mowatt by Mike Glyer. Bookmark the permalink.